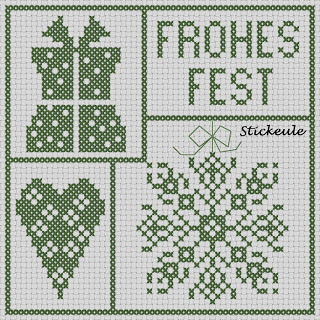 Stickeule always posts great patterns and here’s another one for us to enjoy. I am thinking that “Frohes Fest” basically translates to Happy Holidays in German – at least loosely. So stitch up this design in holiday colors to make a great ornament for your tree. This is not the only design Stickule put up in this blog post, there’s another one that is lovely as well. Head on over to check out the holiday celebrants decked out in their winter clothing. It is a more elaborate pattern. To find both you will need to scroll down to the bottom of the blog post. Get the free patterns.